Outlander Season 2 Entertainment Weekly Exclusive Picture. . Wallpaper and background images in the Outlander 2014 TV Series club tagged: photo outlander season 2 entertainment weekly claire jamie. 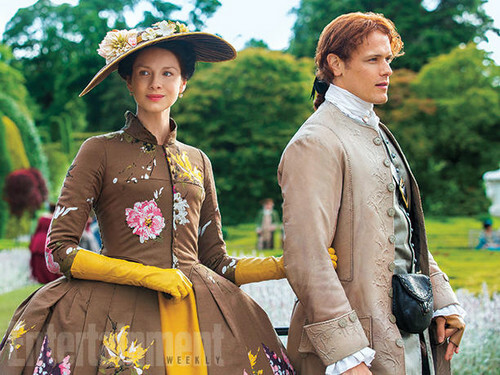 This Outlander 2014 TV Series photo contains polonaise and پالونایسی. There might also be boater, نامہ, پاناما, پاناما ٹوپی, ملاح, skimmer کے, تنکے کی ٹوپی, بواٹیر, لیگہورن, جہاز راں, پونی, بھُس چھجّے دار ٹوپی, fedora کے, محسوس کیا ٹوپی, homburg, سٹیٹسن, trilby رکھا, فادورا, محسوس ٹوپی, ہومبرگ, سٹیٹساون, ٹرلبی, kirtle, and چغہ.